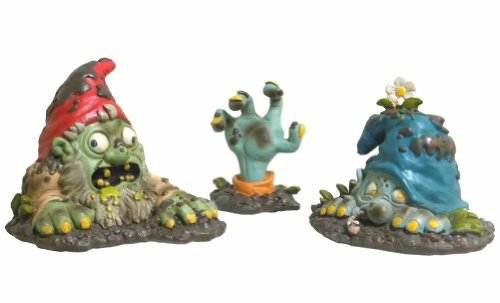 It looks like these zombies are about to become fertilizer in your garden. A head here, a hand there...these creepy zombie lawn ornaments are a great way to dress up your lawn for Halloween. Hand piece includes a metal ground stake. Resin. Set of three. 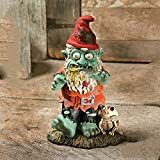 4" to 6"H.
Zombie Gnome. Made of resin. Size is 11 1/2 Inch x 7 Inch. Sales unit is 2 pieces. This oddly cute Halloween lawn decoration will add a touch of undead delight to your decor. This one-gnome Occupy the Backyard protest is joined by his squirrelly pals. Hand-painted resin. 6 7/8"L x 5 1/2"W x 10 3/4"H.